As organizations strive to better manage their business infrastructure, leaders in operations management and system administration are being asked to minimize service disruptions by understanding the impact of changes on the infrastructure; integrate and streamline processes across silos to reduce complexity; and implement “green” IT. Storage infrastructure management software can help. 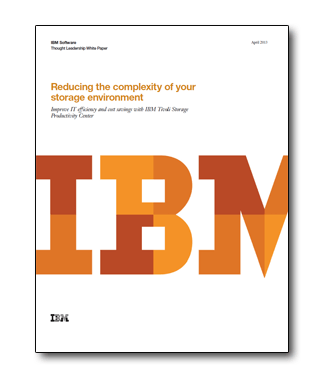 IBM Tivoli Storage Productivity Center is an industry leading storage resource management (SRM) suite that can help reduce the complexity of managing your storage environments. Would you like to be contacted by email Select Would you like to be contacted by emailYes, send me e-mail.No, do not send e-mail. Would you like to be called? Select Would you like to be called?Yes, please calll.No, do not call.Yes, please call. Would you like to receive postal mail? Select Would you like to receive postal mail?Yes, send me postal mail.No, do not send postal mail.